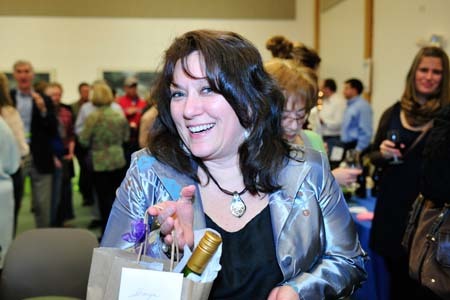 FREEPORT, ME (March 12, 2012) -- The Rotary Club of Freeport held its 2nd Annual Spring Gala Fundraising event Saturday, March 10th. Proceeds from the event go to benefit the communities of Freeport and Pownal through various Freeport Rotary programs. Close to a hundred people joined the Freeport Rotary Saturday evening for the Spring Gala at the Community Services Center on Depot Street, Freeport. The evening began with delicious food donated by Linda Bean’s Kitchen, Buck’s Naked BBQ, Old World Gourmet, and chocolates from Wilbur’s. Raffle and auction items were available for bid throughout the event. The spring fashion show kicked off just after 7:00 with members of the local Police and Fire departments as the runway models. Clothing was provided to male and female models by local vendors including Jos A. Banks, New Beginnings, Co/Op, Rapid River Boutique, LL Bean, GAP, Sashay’s, Mexicali Blues and Jockey. “It was a pleasure to work with the Rotary on this fundraising event,” stated Tina Hendricks, Mrs. Maine 2011. “I hope the firefighters and paramedics had as much fun as I did. We had several practice sessions and I gave them runway advice, but they took it from there and really put on a great show.” Mrs. Hendricks represented Maine in Mrs. America 2011 and received the National Photogenic Winner award. Michele Bois-Gilbody, Rotary coordinator of the Spring Gala, contacted the Freeport Fire Department for their participation in the event. In addition, to the joint efforts and experience of Fire and Rescue and Rotary individuals working together, it was “great to see the human side of our first responders. Their work is so intense, but they know how to have fun and help support our community,” commented Bois-Gilbody. Proceeds from the event will support such local programs as: Freeport Elders Association, Freeport-Pownal Children’s Libraries, Freeport Fire Company, Good Sheppard Food Bank, Holiday Help Line, Fuel Fund Support, Summer Rotary Youth Leadership Training, Freeport-Pownal Little League and more. The Freeport Rotary Club also provides international giving to such programs as Seeds of Independence, Asian Tsunami Relief in India and the Polio Plus Worldwide Eradication Program. For more information on Rotary programs or to find out how you can join the Rotary go to www.freeport-rotary.org. Ben Le Hay was the Master of Ceremonies for the fashion show, other fashion volunteers included Barbara Jordan as music coordinator, Shay Johnson/Owner of Sashay’s Boutique, Tina Hendricks/Owner of Lipgloss for Lives, Sharyn Peavey/photographer, and hair and makeup by Acapello. Rotary event coordinators included: Debora King, Matt Cartmell, John Bourassa, MaryBeth Hassett and Michele Bois-Gilbody. The Freeport Rotary Club, formed in 1983, is a volunteer service club providing service to people in the Freeport and Pownal areas, and around the world. It is comprised of professionals, business owners and community leaders who live or work in the Freeport and Pownal areas. Freeport Rotary is part of the global organization collectively known as Rotary International or simply Rotary. Members of Rotary clubs provide humanitarian service, encourage high ethical standards in all vocations, and help build goodwill, peace and understanding in the world. There are over 33,000 Rotary clubs in more than 200 countries and geographical areas. Clubs are nonpolitical, nonreligious and open to all cultures, races and creeds. As signified by the motto, Service Above Self, Rotary’s main objective is service – in the community, in the workplace, and throughout the world.